Will instructor-led training (ILT) be completely eliminated from organization training programs? It’s a question that pops up often, both from learners and training staff. I find this question annoying. Not because I think it’s without merit – it is an important discussion in a time of change. But I tend to lock down on the subtleties of the terminology and usually come to the conclusion that we have a communication and assumption problem before we even start solving mystery deaths. Learning is about communication, so it’s important to be clear about what it is that we are discussing here. Competences for Online Teaching: A Special Report (Goodyear et al, 2001) provides a summary of a conference on the subject of online learning and competencies. 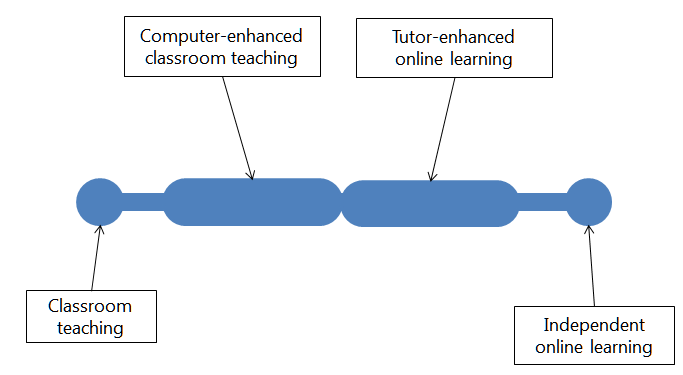 The paper includes a figure that illustrates four broad areas along a horizontal line: classroom teaching, computer-enhanced classroom teaching, tutor-enhanced online teaching, and independent online learning. Rather than two discrete ends and two contiguous intervals as illustrated in the paper, I think of trainer involvement as a decreasing but progressive along the graph. At the far right, “independent online learning” still has the trainer “leading”, in the sense that learners may be watching a video or completing an activity independently, but that activity or lecture is still led by the instructor. Sill traces of ILT? There is something else implied in that line, something that impairs our ability to understand the full range of learning scenarios. The assumption is that as the instructor’s involvement fades, physical presence also fades. But let’s assume for a second that physical presence is not a function of the chart above, but a new orthogonal variable. Let’s introduce that variable in a chart and see what we get. 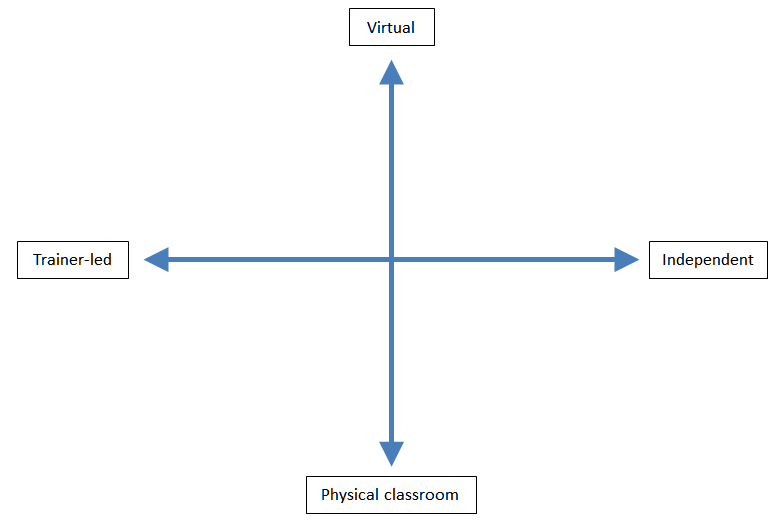 I would argue that there is a plausible learning scenario in every location within these quadrants. Let me go to the bottom right corner, for example: minimal trainer involvement, classroom experience. Think about a group of children playing in a playground. They are receiving absolutely no direction, but they are actively learning from others. They are doing so in their “classroom”, the playground. “Networking sessions”, as we call them sometimes, fall roughly around this area of the chart too. Let’s move to the top left of the chart. I have witnessed wonderful examples of trainers taking a large group online through an effective learning experience. Great participation, great interaction, 100% trainer-led, but happening virtually across several countries and cultures. Some of these are called “webinars”, and in my training dictionary, this is also ILT, instructor-led training. Our terminology is flawed. ILT is perceived as antagonist to WBT, when in fact most WBT is also ILT. So are we about to witness the death of ILT? I think ILT is alive and well, and will do well in the future too. Of course we may be asking this question for a very different reason: perhaps our business model or our employment is linked to ILT coupled with physical presence. That combination won’t die either, but it is just a thin line in a big and exciting chart. Why confine the business there?